This example uses Java looping statement specifically the while loop but you can also use the different looping statements. 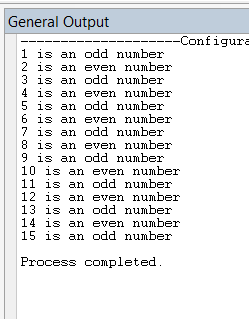 The example below will display numbers from 1 to 15 and will use a conditional statement (if else) to identify if the number is odd or even. Feel free to visit Odd or Even Code in PHP here. Refer to the previous article about the while loop for explanation on how to use it. I'll just jump into the conditional statement if which contains the condition wherein we get the remainder of the i. If the remainder is 0, then it will display even. Otherwise, it will display odd. Just add a line break which is the \n to insert new line after each value.